Fishermen in the San Juan Islands are being asked to make sacrifices this summer to help Puget Sound’s fish-eating killer whales. Whether the voluntary actions will make much difference is open to speculation. “This voluntary no-go zone is a good step in helping to reduce human impacts in an important foraging area for Southern Resident killer whales,” Penny Becker, WDFW’s policy lead on killer whales, said in a news release. Years ago, the western shoreline of San Juan Island was a primary hangout for whales, which eat mostly chinook salmon during the summer months. In recent years, however, declines in chinook runs have reduced the time spent by the whales in any one location, so the effects of the voluntary closure are likely to be muted. The Southern Resident orcas are listed as endangered under the Endangered Species Act. Their declining numbers inspired Gov. Jay Inslee to consider emergency actions to save the species from extinction, and he appointed a task force to come up with recommendations later this year. The idea of protecting the whales by reducing fishing seasons was considered all during negotiations between state and tribal salmon managers this spring in a discussion known as the North of Falcon process. Fishing seasons were reduced, in part to protect low numbers of chinook salmon returning to Hood Canal and critical streams in northern Puget Sound. After the negotiations were complete, the National Marine Fisheries Service called for additional specific steps to protect the killer whales. The agency — part of the National Oceanic and Atmospheric Administration — oversees efforts to recover endangered marine mammals and has the authority to approve or deny annual fishing plans. “This step will help support killer whale recovery and prevents a potential delay in federal approval for our salmon fisheries throughout the entire Sound,” said Ron Warren, head of WDFW’s fish program. Given the reduced chinook fishing scheduled this year, the voluntary no-go zone is a difficult request to make of anglers, Warren acknowledged. It isn’t clear how much the quarter-mile closure zone will help the orcas, even if every boater complies with the voluntary measure. The goal is to offer the whales more fish to eat and to reduce the noise and interference of boats, which can affect their ability to hunt for salmon. The measure could help some whales for brief periods, but it won’t affect the overall population, said Ken Balcomb, longtime orca researcher who knows the whales well. Lately, Ken has been promoting the removal of dams on the Snake River to boost wild runs of chinook in the Columbia River, since the whales forage along the coast, especially in the winter. Meanwhile, the Legislature has set aside money to boost chinook production in state hatcheries, but implementation of that program is still underway. For commercial whale-watching boats, the newly announced no-go zone will have minimal effect, since most follow the guidelines of the Pacific Whale Watch Association, said Jeff Friedman, the association’s president for the U.S. The same goes for private whale-watch boats that follow those guidelines. “We have guidelines that go beyond state and federal regulations,” Jeff said, noting that the association’s voluntary guidelines already keep whale-watching boats well offshore when orcas are present. 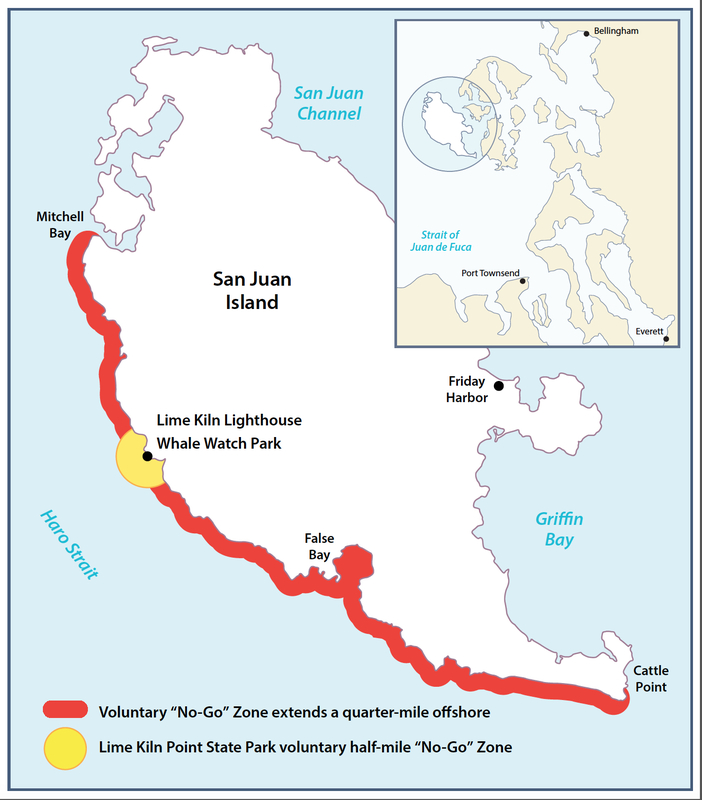 The guidelines are identical to the voluntary no-go zone, except that the no-go zone extends the closure area by about three miles — to the southern tip of the island. Those most likely to be affected by the voluntary closure are sport fishermen, who move in close to shore to catch salmon that come through the Strait of Juan de Fuca and follow the San Juan Island shoreline during their migration. The no-go zone could really hurt the fishing business, according to Brett Rosson, who operates charter boats out of Anacortes. “In August and September, this is our primary fishery,” he said, noting that sport fishermen were forced to give up chinook fishing in the area during most of September this year to protect low runs elsewhere in Puget Sound. The no-go zone calls for giving up August as well, he asserted. Brett argues that anglers’ effects on killer whales are minuscule, because the orcas are so rarely around San Juan Island and because the fishermen take so few fish. His boats, which carry from 14 to 20 people, might take four chinook on a good day, he said. It would be one thing if the whales were being hurt by fishing, he said, or if the no-go zone were in effect only when whales are present. The real culprits are the salmon-eating seals and sea lions, which nobody wants to deal with, he added. Meanwhile, commercial fishermen have been declared exempt from the no-go zone and will go fishing as originally planned. As long as the no-go zone is voluntary, Brett said he will go fishing in conformance with this year’s fishing rules. But he acknowledges that there could be a downside to his actions. Norm Reinhardt of the Kitsap Poggie Club said many residents of Puget Sound who enjoy annual trips to the San Juan Islands won’t go this year because of confusion over the voluntary exclusion zones. And future years might be ruled out if formal regulations are approved to close the area for good. Ron Warren of WDFW said anglers have more opportunity this year to fish for coho salmon than in recent years, and ongoing efforts to restore chinook will benefit both human fishers and killer whales. For information about this year’s salmon fisheries, go to the North of Falcon website. What commitment will you make, or will you step up and make sacrifice some portion of your livelihood or free time?